In 1972, when I read Robin Graham's book, Dove, about his around-the-world adventure, I knew that what I wanted to do with sailing was not to race in regattas on Lake Michigan but to see the world from a sailboat like Robin had done. I was only fourteen at the time and living in mostly land-locked Wisconsin, so the possibility of buying a boat and sailing it around the world seemed pretty remote, a someday dream that I didn't actively work toward for many years. One day in the mid-1990s, I was at the office of one of my computer business clients in downtown Aspen, and I noticed a framed photo of a sailboat on his desk. "Nice boat," I said. "Is it yours?" He said that it was and asked if I had an interest in sailing. "Yes," I said, "but a boat like that is awfully expensive, isn't it?" Not as much as you'd think, he replied, especially for an older, used boat. "Where was that picture taken? It looks like somewhere in the Caribbean." It is, he said. "So how does that work?" I asked. "You're here in Aspen and your boat is down there?" He said that every few months he would fly down to where the boat was stored, sail it to the next destination, put it back in storage, and fly home. In this way, he was slowly touring the Caribbean by sailboat, an island at a time. The idea I had been holding for more than twenty years that owning a decent-sized boat and sailing it on the ocean was something I might never be able to afford either in terms of money or time was suddenly gone. If this person could do it, I thought, why couldn't I? How to get started though? About this same time, Phil LeBoutillier walked into my office. He said he was developing a bed and breakfast in the Bahamas (tomatopastehopetown.com) and needed some assistance getting a computerized accounting system set up to track the project. He also said he had noticed my Minifish leaning against a wall out front and wondered if we couldn't maybe work out a trade for some fiberglass repair work. There was still a deep scratch on the bottom from a bad day sailing on Lake Mendota, while I was at the University of Wisconsin in the late 1970s, when I was blown into rocks near the shore. He invited me to come with him to check out his shop a few blocks away where he was building a plywood dinghy for a new trawler he had bought as a transport boat for the bed and breakfast. The dinghy was a cleverly designed skiff, with the plywood sides and bottom curved around a sturdy frame. Phil was in the process of fiberglassing it so the shop smelled of chemicals. He said that since he was already at it, we should just go get my boat and fix the scratch. We shook on the trade and on our newfound friendship. When I asked Phil later where he had gotten the plans for his skiff, he handed me a catalog of boat plans. I can't find it now but I know I still have it somewhere, and I think it might have been Fifty Wooden Boats, published by WoodenBoat. In addition to smaller boats like the skiff, there were plans available for cruising sailboats, which I studied carefully. One in particular looked like the right combination of sailplan and layout without being too large to build in a big garage and transport to the ocean by flatbed truck. But did I have the time and more importantly the skills to build a wooden sailboat from scratch? This series picks up where "Introduction" left off as my very first post to this blog, way back in March, 2005. After my family purchased an AMF Alcort Minifish in June of 1969, when I was eleven years old, my interest in sailing never diminished. We would put the boat on top of the station wagon every summer for our vacations to Waupaca or our trips to visit Grandma in Iowa. I kept Royce's Sailing Illustrated next to my bed and studied it nightly until I knew all the concepts and vocabulary, and could tie every knot. My friend Mark Wiars and I even played a sailing board game, Regatta, at his home after school. Mark always won because he saved his Puff cards for the finish. At that time, we were mostly interested in small sailboats because that was our experience: my family's Minifish, the boats we sailed at Boy Scout camp, the boats we saw sailing on Wisconsin's lakes. Mark and I dreamed of sailing racing boats on Lake Michigan. He was a fan of the Star, while I favored the Lightning. Royce's contained excellent illustrations of both boats, so we would argue their relative merits like other kids argued over which professional athlete was better. Looking at my almost-forty-year-old copy of Royce's just now, I think Mark had the edge since the Star featured a lead keel while the Lightning used a wooden centerboard. On choppy Lake Michigan, the Star would be the safer and faster boat. I think this was the beginning of a long tendency on my part to overestimate a particular boat's seaworthiness. There were many other boats illustrated in Royce's, including coastal cruisers and passage makers, but as kids we didn't pay much attention to those since they seemed so out of reach. The closest we came to thinking about that type of boat was Dove, the 24-foot sloop that young Robin Graham sailed around the world in the 1960s. As I said in my Introduction, reading a National Geographic article about Robin's circumnavigation was the beginning of my own dream to sail around the world. 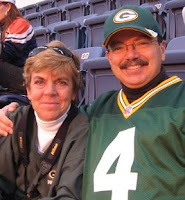 Back in July, on the normally unlucky 28th, we were lucky enough to win tickets to the October 29th Monday Night Football game between the Green Bay Packers and the Denver Broncos. If you watched it on TV, you know it was a heckuva game. The Packers won it 19-13 in overtime on the very first play from scrimmage when Brett Favre launched a fifty-yard bomb to Greg Jennings, who took it the rest of the way for a touchdown. We were up in the nose-bleed section at Invesco Field at Mile High, so it took a long time to work our way down the ramps after the game was over. The energy from the sudden victory was so high that all the Packer fans walking near us chanted "Go, Pack, go!" all the way out of the stadium. It was a veritable Packers lovefest. Before the game, while I was up in our room at the Hotel Teatro getting ready, Nan took our dog Charlie, always a welcome guest of the hotel, for a quick pre-game walk. As they returned, Brett Favre's wife Deanna and her traveling companions were taking pictures in front of the hotel while they waited for their ride to the game. Charlie, who is a very friendly golden retriever, walked right up to them. It didn't hurt that he was wearing a Packers bandana around his neck. Nan joked that they should have him pose with them, but they were done taking pictures. Deanna petted Charlie for a few seconds and then the moment was over. The luck of this chance encounter surely must have rubbed off on the Packers later that evening. Go, Pack, go! On our final day in Florence, Nan and I visited the Galleria dell'Accademia, home to the original statue of David by Michelangelo. The photo to the left is of the copy in front of the Palazzo Vecchio, which we passed several times while wandering around Florence. This did little, however, to prepare us for seeing the original in its permanent location. I experienced the same rush of emotion when I first spotted David at the end of the hall devoted to Michelangelo's sculptures as I did when I saw Van Gogh's Starry Night in the Museum of Modern Art in New York and Da Vinci's Mona Lisa at the Louvre in Paris. There is something about being in the physical presence of artworks that one has known about their entire life but only previously seen in photographs that is incredibly life-affirming. Yes, it really does exist, and yes, it really is as beautiful as you imagined. Every photo I had ever seen of David had been taken from the front, and I could never figure out why his hands were positioned as they were. Was his final scrap of clothing flung casually over his shoulder? Did he have an itch he was scratching with that over-sized right hand? As with most displays of sculpture, it was possible to walk completely around David, taking him in from every angle, and that solved the mystery for me. David's sling is slung across his back, the handle end in his right hand and the pouch with the stone in it in his left. All the descriptions I had ever read, including the one on the plaque in front of the statue, said that David's facial expression was one of confidence in victory, similar to the expression on Donatello's earlier David, who while also naked is wearing a war helmet, holding a sword and standing with one foot on the severed head of Goliath. When I saw the sling, I suddenly realized that this was completely wrong. David was not contemplating his victory, he was at the moment of attack. His weight was on his right foot, his concentration was focused to his left, and his sling was at the ready. It was easy to imagine him stepping quickly and confidently to his left, at the same time releasing the pouch in his left hand, swinging the sling powerfully around his head and letting fly the fatal stone. The expression on his face is not victorious at all but rather the grim determination of one about to commit a necessary murder. As I stood there restructuring my thinking, the genius of Michelangelo was apparent. In one statue he had managed to capture the beauty of the human form and the menace of its physicality, the peace of a body at rest and its anticipated motion to violence. On our return to Florence by train, Nan and I shared the first leg to Pisa with Burton and Virginia from our Wayfarers hike. They were scheduled to fly out of Pisa the next day, Sunday, while we were set to fly out of Florence on Monday. So we spent the afternoon together wandering around Pisa until Nan and I boarded another train for the final leg to Florence. Our time in Florence and the Italian Riviera had definitely spoiled us. Except for the area immediately around the famous Leaning Tower, Pisa was sorely lacking in charm. It is a modern, mid-sized port on the Mediterranean, and this function clearly dictates its form, which was evident from our taxi rides to and from the train station--factories, warehouses, wide busy streets, numerous traffic lights, and block after block of post-War two- and three-story brick buildings with shops on the ground floors. One of the reasons we got off the train in Pisa was that I had convinced Nan we needed to see the Leaning Tower of Pisa as an homage to Galileo and his famous gravity experiment. Galileo is supposed to have climbed to the top of the Tower and dropped two different-sized cannon balls simultaneously. The reasoning of his time was that the larger, heavier ball would fall faster. In fact, they hit the ground at the same time, proving that gravity acts equally upon all objects regardless of mass. Enough with the science lesson. As with the two previous posts, this one also contains a slideshow. Just click on the Leaning Tower photo if you already have Adobe Flash Player installed. And click here if you don't. 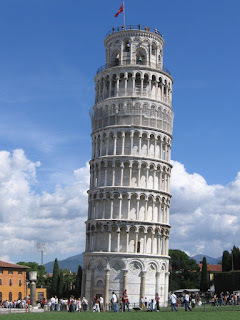 The first ten pictures and captions are of the Leaning Tower and the area around it. The remaining ones are from our last full day in Florence. I had just finished reading Ross King's Brunelleschi's Dome, so these final pictures favor Brunelleschi and his work. Salve! Our main reason for traveling to Italy was to join The Wayfarers on their Cinque Terre and Italian Riviera walk, not just to wander around Florence, although you might agree that that was an exceptional experience if you watched the first slideshow, "Flo-rence, Part 1". "The pathways and rocky terraces of the Cinque Terre were forged by the Romans as trade routes. Expanded by the residents of the remote and remarkable "Five Lands," they wind along spectacular bluffs overlooking the Mediterranean, linking five enchanting villages nestled in the cliffs and harbors of the "Italian Riviera." Pastel houses reach down to the sea. Terraced vineyards and olive groves are supported by walls hundreds of years old. World Heritage status assures the preservation of this precious land--its breathtaking natural beauty and cultural treasures. We walk the legendary Sentiero Azzurro and the Via dell'Amore. Their names recall the blue Ligurian Sea and the romance and passion evoked by this magical corner of Northern Italy." The pictures and captions contained within the Flash-based slideshow capture most of our adventure, and the itinerary below will help with the route and chronology. 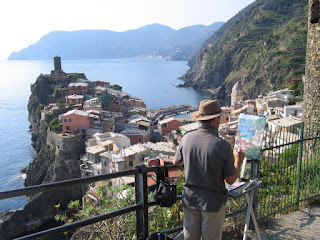 So if you already have Adobe Flash Player installed, go ahead and click the picture above of the artist painting a picture of Vernazza to go to the second Italy slideshow, "Wayfarers Walk: Cinque Terre and Italian Riviera". If you need to install Flash Player, please click here. As with "Florence, Part 1", there are three different ways to view the show, so be sure to experiment with the different slideshow buttons. Sunday, September 23: Nan and I took the train from Florence to La Spezia, meeting up with fellow Wayfarers hikers Burton, Virginia and Jean--all from the St. Louis area--along the way. Our guide Paolo and our trip manager Anna met us at the train station and drove us to our hotel in Portovenere. At the Welcome Dinner and Introductory Talk that evening, we met the rest of our hiking group--George from Des Moines, Jerry and Seena from Long Island, and Pauline and Barbara from Long Beach. Monday, September 24: The Wayfarers van dropped us off in the morning near Campiglia and we hiked to Riomaggiore, the first of the Cinque Terre villages. After lunch, we took a ferry to Monterosso, the last of the Cinque Terre villages. Paolo said the trail between Vernazza and Monterosso was not very interesting so we wouldn't be hiking it, but he wanted to be sure we spent a least a little time in each of the five villages. We explored Monterosso and then took the ferry back to Riomaggiore. Tuesday, September 25: At the Riomaggiore harbor, we started hiking the Via dell'Amore, passing through the second Cinque Terre village, Manorola, then up to Volastra and down to lunch in Corniglia, the third Cinque Terre village. In the afternoon, we hiked the seaside path to the fourth Cinque Terre village, Vernazza, where we caught a train to our hotel in Sestri Levante. Wednesday, September 26: The Wayfarers van dropped us off above Sestri Levante and we hiked to Montellegro, where we ate lunch, explored the cathedral and then took the cable car down to Rapallo. We drove to Camogli, which was to be our headquarters for the next three nights. Thursday, September 27: We caught the bus to the top of Camogli and then hiked through the woods to legendary Portofino, where we ate lunch, shopped and witnessed a water spout over the harbor. In the afternoon, we hiked to Santa Margherita, where we caught a train back to Camogli. Friday, September 28: From the same spot at the top of Camogli, we hiked down the coast to Punta Chiappa, where we caught a ferry to San Fruttuoso, an ancient Abbey accessible only by sea or by foot. We toured the Abbey and village, ate lunch and then hiked again to Santa Margherita, where we again took the train back to Camogli. That evening we celebrated our successful adventure with a Farewell Dinner. Saturday, September 29: Nan and I joined Burton and Virginia for a train ride to Pisa, then on to Florence for a couple more days before flying home. Stay tuned for the final Italy slideshow, "Pisa and Florence, Part 2".